With the highest Billboard Hot 100 turnover rate in 27 years, Luis Fonsi and Daddy Yankee's "Despacito" featuring Justin Bieber is the latest song to reach the top of the songs chart. The song moves from No. 3 to No. 1 with strong streams and sales, two components of the formula. The new No. 1 hit is reflected on the May 16 chart update for the tracking week ending May 11. "Despacito" claims the No. 1 position on Digital Songs for a second non-consecutive week after selling 104,000 copies which is up nearly five percent. Over on Streaming Songs, the track which is the first mostly Spanish song since 1996's "Macarena" takes the lead on the chart with 54.3 million streams through official platforms such as Spotify. "Despacito" is gaining traction on Radio Songs moving from No. 18 to No. 11 having 57 million impressions in the U.S.
"Despacito" is the first No. 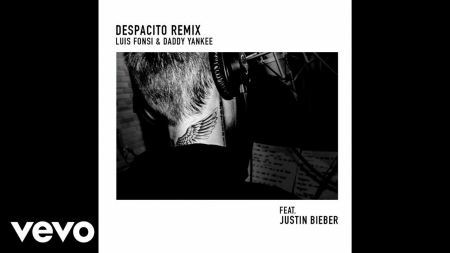 1 for Luis Fonsi and Daddy Yankee while it is Justin Bieber's fifth. Bieber is the only artist to have a two new No. 1 songs back to back after DJ Khaled's "I'm the One" with Chance the Rapper, Quavo and Bieber debuted at the top of the chart, the 28th song to do so in the history of the chart. He is however already part of 12 acts that have replaced themselves on the chart when "Love Yourself" took over "Sorry" in 2016 which became his third leader.